You can look forward to a second round. Luxurious beauty care in a limited edition. MBR once again brings back the clutch with the unique products of Pure Perfection 100 N® to retail trade. MBR Pure Perfection 100 N® is a newly defined, extraordinarily efficient antiaging cream that activates all epidermal cell functions. Beauty that can be bought. Your luxurious Pure Perfection care ritual. Your skin radiates in purity, clarity, appears refreshed, matted, even and is ultra-optimally prepared for every following step in the care programme. The intense fresh experience. Regenerating, moisturising and intensive care lip balsam with a leasant refreshing effect. 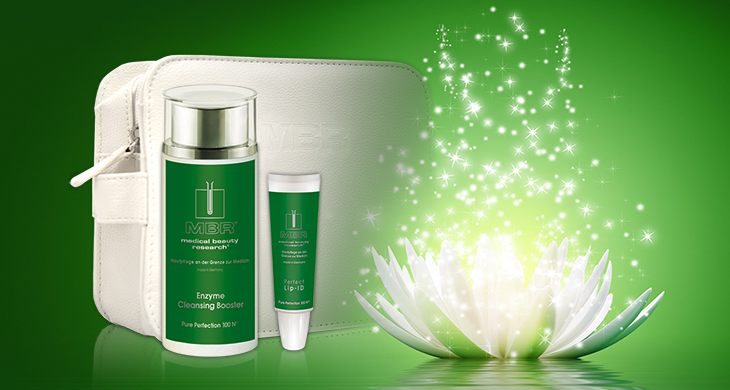 Minimises signs of premature skin ageing.